Add Sugar,Raisins.Coconuts.Cook it till it becomes thick. Thanks to you all for viewing myrecipe 7170 times.. 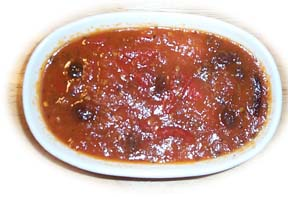 Thanks, for reminding me about my all time favourite Tomato [meethi] Chutney. Your method is really good. I shall try it sometime next week. As a matter of fact, we lived in Pune [but only for a few months time though] sometime in the late eighties, as it was a part of my husband's transferable job. There, one of my good friend taught me how to make 'Tomato chutney-the Pune way'. I used to prepare it quite often as my family relished it without any complaints. Now, ofcourse, living abroad for decades, their tastes have changed for bad. :). Anyways, thanks again, and you keep up the good work.